That Mistake? It’s Part of the Design. I’ve written often about important it is for knitters to learn to spot their mistakes and figure out how to remedy them. I firmly believe that one won’t become a Fearless Knitter without learning how to fix mistakes. If you allow an error to ruin a project — in your mind — then you’ll abandon it, be discouraged, and be less likely to try something else. I’m also a firm believer in each knitter finding the best remedy for his or her particular project at the time. This will differ based on complexity, how far into the project you are, how long you’ve got to go, the scope and scale of the mistake (among other things). How far back do you need to go to fix the mistake? How obvious is the error? It’s nearly impossible not to see an error — since we knitters can spot our own mistakes from across the room. The real question is: How comfortable are you with letting go of a mistake and just letting it be? 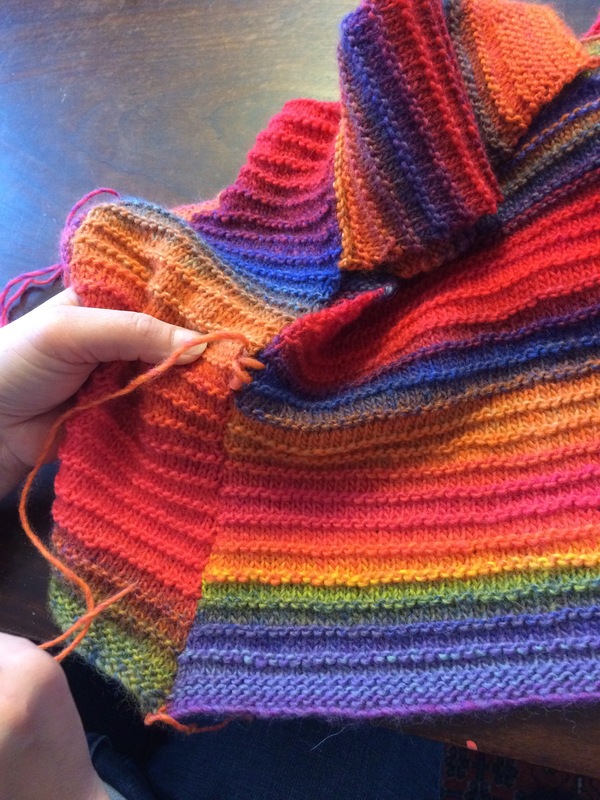 Every knitter has a different tolerance for mistakes, one that may vary depending on project, mood, and deadline for finishing. Like me, Fearless Knitter Marcia is comfortable with finding her own way to deal with the inevitable mistakes. You may recall how she treated a few errant stitches on the complex Aran Afghan square that she worked on during her girls’ fishing and drinking weekend. 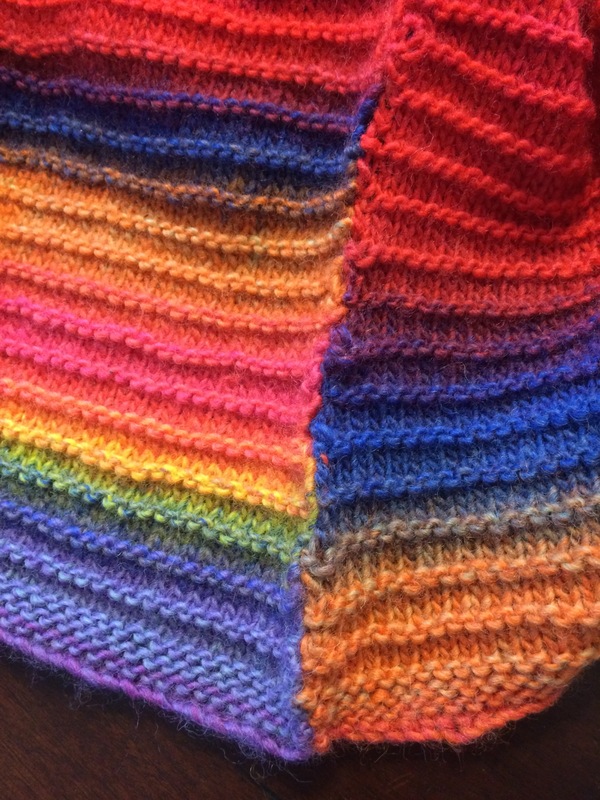 At class recently, Marcia shared how she remedied a mistake in the button band of a baby sweater. See that row — opposite the button hole — that she forgot to purl (or maybe knit, depending on the direction)? Well, Marcia didn’t see it until she’d knit a couple more inches of the top-down sweater. So, rather than rip back all that work, she incorporated the new “design element” into the rest of the button band, lining up the next line opposite the next button. Damn clever! What mistakes and/or fixes have you been particularly proud of? There are lots of online tips for making a too-big sweater smaller. But as I discovered when I had the opposite problem — a too-small sweater that needed enlarging — there wasn’t a lot of help. With a fair bit of in-person, online, and book research, I was able to figure out how to make Michael’s special sweater large enough to fit his 17-year-old body. I learned a few things along the way, about myself and about knitting. I’m not afraid to rip back and try again, especially when making something complicated and very time-consuming. A lot of time and effort went into this sweater even before I discovered that it didn’t fit. I’ve knit plenty of finished items that didn’t turn out right and were abandoned to a drawer or thrift store somewhere. This time, I decided to invest the time and energy into remedying the situation. Making a sweater longer is pretty straightforward: Rip or cut back the ribbing. Pick up the stitches (I used a lifeline for this bit), and knit! 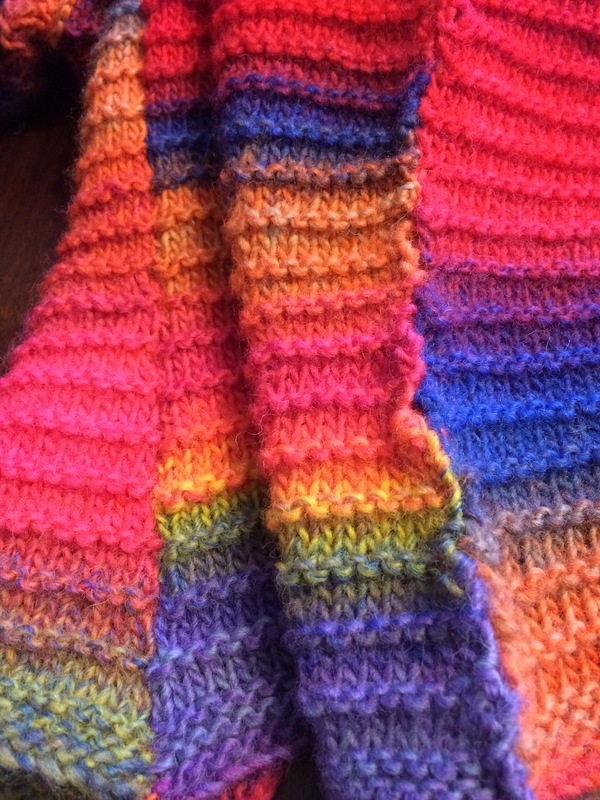 Knitting in the opposite direction changes the orientation of the stitches. If you look carefully, you can see that the white “specks” point up or down, depending on whether they’re in the original body of the sweater or in the added two inches. Gussets are pretty nifty inventions. I needed to add about 4 inches to the circumference of the sweater, so I made two two-inch gussets — rectangular from the ribbing to the underarm and then tapered over about 4 inches into the arm sleeve. I appreciate attention to detail but not enough to make the gussets fit the sweater pattern. Wrapping a knitted gift is a wonderful thing! I’m delighted to report that the sweater fits — at least, that’s what Michael has told me! He’ll allow a photo “session” once the weather gets cooler. Of course, I’ll share. ***** SPECIAL WELCOME TO READERS WHO FOUND ME VIA WEBS Yarn Store (one of my favorite places)! If you like this post, please scroll back up the page & subscribe. You’ll get an email each time I publish (once or twice a week) or connect on Twitter. Leave a comment if you’re a blogger, and I’ll follow you back! As I’ve mentioned previously, the sweater that I knit for Michael is finished but not done. What I really mean is, it’s too small. This may have something to do with his increase in size from when I started the sweater. At the beginning of the year, he was on the high school wrestling team and was pretty lean — for a six-foot tall 16-year old. But after wrestling season, he started lifting weights and training in anticipation of football and, well, he got larger — much larger — as in 35 pounds heavier (“increased muscle mass” is his phrase). We both managed not to get too upset (well, mostly) when he barely squeezed into the finished sweater sometime around the end of May, an event I did not photograph. We agreed that it’s beautiful, but there’s no way he could wear it. Here it is blocking before sleeves. Kevin, who’s older but smaller than Michael, volunteered to take the sweater, assuring both of us that it would fit him just fine. How very generous! But I resolved to figure out how to fix it. knit two 2″ gussets to sew into the side seams, thereby adding 4″ to the circumference of the sweater (well, minus maybe 1/2″ total of seaming). The gussets are rectangles up to the underarm and then tapered to a point over about 4-5″. I hadn’t reached the tapering in this photo. I’ll have to open the underarm sleeve seam for a bit and add the tapered part of the gussets there. I really, really hope this works. Wish me luck! Knitters won’t be surprised to learn that the definition of “lifeline” in most dictionaries, paper and digital, does not include this handy technique that has saved the life of many a knitter. FIguratively, not literally, of course. But learning how to use a lifeline can enable you to finish a project, thereby “saving the life” of the project, and that should count for something! Last year, when the cuff of a sock was too tight for the intended wearer, a lifeline allowed me to cut off the offending section, pick up stitches, and make a new cuff. In the past week, I’ve used lifelines to rescue two projects, Michael’s finished-but-not-done sweater and the recently started Old Shale Wimple. Michael’s sweater is about two inches too short. It’s also too tight across the chest, but that’s a more complicated issue to be dealt with at another time. Rather than tear out the ribbing around the bottom of the sweater bit by bit — too slow and painstaking a task for me — I wove a strand of white yarn into a row above the ribbing, catching each stitch. With that row firmly held by the lifeline, I cut the ribbing off the sweater. And then picked up each of the stitches held by the lifeline. I picked off the extra bits of yarn from the ribbing side, so the stitches on the needle were ready to be worked. I’ll need to add two inches to the body of the sweater and then add the ribbing. The wimple’s rescue was similar but was necessitated by my carelessness in following (i.e., not following) the pattern. I’ll save the specifics of that adventure for another post, but here are the steps of the wimple lifeline. Learning how to fix mistakes is the key to finishing projects. And I’m getting lots of practice these days! For the past few months, I’ve been monogamous in my knitting, working on Michael’s sweater with the hope of finishing it by Memorial Day, when it’s still cool here in Massachusetts. The sweater is finished, but it’s not done. But that’s a story for another day…. In the aftermath of finishing/not-finishing, I’ve cast on two smaller projects, neither of which will have size issues. Last fall, I bought a skein of Kidding Ewe by Done Roving Yarns at Bee’s in Bar Harbor, Maine. “Cherries Jubilee” is a yummy mix of reds, purples, and greens that will make a lovely cowl or, in this case, a wimple. Yes, “Maria” has been running through my brain. Second project: “A Good, Plain Sock” in Berroco Sox. This pair for Patrick, who casually commented that I’d knit socks for everyone in the family except him. What’s on your needles these days? I must confess that sweater sleeves make me nervous — specifically, the sewing of sleeves to the body and shoulder of a sweater. The seams along the length of the sleeve are easy enough since the stitches line up one-to-one. But as you approach the shoulder, the geometry gets a bit more complicated, with decreases that create shapely curves but can create challenges when it comes to lining up the sleeve to the sweater body. So it’s no accident that the sweater pattern than I selected as the basis for Michael’s sweater has “flat top” sleeves, no taper, no sleeve cap. If I’d watched this terrific, clear, and helpful video from Knit Picks on how to set in sleeves before selecting the pattern, I may have chosen something different. Next time perhaps…. First step (after blocking all pieces, so really it’s the second step) is to line up the sleeve with the body and secure it. Some knitters use safety pins, clip-on stitch markers, or even paper clips. I prefer to tack — or tie — the sleeve to the body, taking care to line up the center of the top sleeve edge with the shoulder seam. It’s also important to be sure that the side edges of the sleeve extend equally down the front and back of the sweater. That makes an even armhole, but even more importantly, ensures that the sides of the sweater line up evenly when the time comes to sew those together. When I’d secured the sleeve to the shoulder, I asked Michael to try it on to see if the armhole was big enough. He carefully put his head through the neck, draped the cape-like garment over his shoulders — and the sleeve dropped right off! As I near the finish of Michael’s sweater, I try to balance the desire to hurry up and be done with it already with the desire to ensure that it’ll fit properly and look nice enough that he’ll want to wear it. Most knitters can recount clothing they’ve made for family or friends that never sees the light of day, remaining in drawers or closets somewhere. Blocking before sewing is one of those important details. Plus, it’s fun to see the pieces laid out and lovely. Last night, when the 1.5″ neckband that the pattern called for was too high and turtleneck-ish for Michael’s taste, I calmly patiently carefully tinked* back several rows and binded off a 1/2″ neckband (K2 P2 ribbing). Much better, Michael declared. * Tink = knit spelled backwards; the process of un-doing knitting stitch by stitch, rather than ripping out row by row.